Aldi have today exchanged contracts with Churchmanor Estates for a new store on the 15 acre Stane Retail Park at Stanway, currently being considered for planning by Colchester Borough Council. If granted, the scheme will include B&Q, Aldi, and M&S Food Hall and conversations are on-going with other home ware operators. Designed by leading architects Corstorphine + Wright the scheme will be modern and contemporary in style whilst fitting into and complementing its surroundings. Careful consideration will be given to the landscaping to enhance its appearance. Stane Retail Park is the second phase of development, joining Stane Leisure Park which is under construction currently and will be home to KFC, Nandos and Starbucks. Aldi would be looking to relocate from their comprised and highly congested store in Lexden into a larger, modern building in their latest format. Roland Stanley, Aldi Property Director, said: “We have enjoyed welcoming customers from across the Stanway area to our store in Lexden since opening in 2010. As more and more people switch their shopping to Aldi, the existing store and its car park are becoming too small to serve our growing customer base. 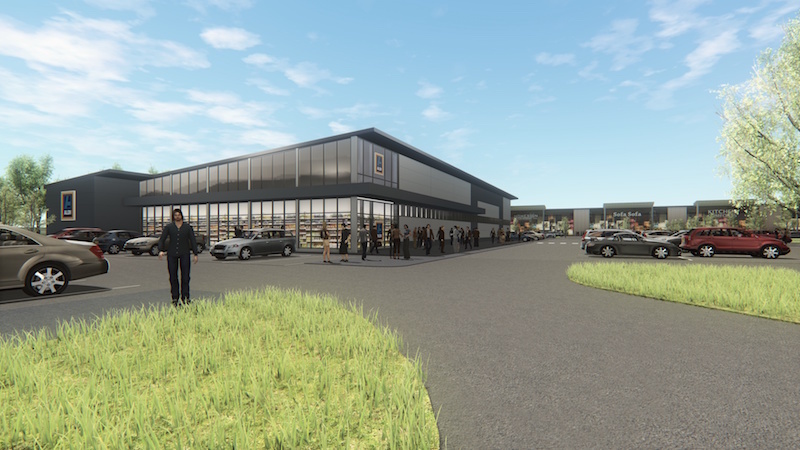 “As well as being more modern, the new store at Stane Retail Park will be almost twice that size and will allow us to welcome even more people to experience Aldi’s award-winning offer of brand-like quality at unbeatable prices. Overall the scheme is predicted to employ in excess of 300 staff, including just over 100 transferring from the B&Q store in The Hythe, and the Aldi Store in Lexden. Matt Cloke, Development Director at Churchmanor Estates said: “We are very pleased to announce the second pre-letting at Stane Retail Park, having exchanged contracts with Aldi to provide them with a brand new store, subject to the grant of planning permission. “At 18,482 sq ft, the new store will enable Aldi to relocate to larger, purpose built premises, in their latest format and in a much more accessible and sustainable location, allowing them to significantly improve the shopping experience for their customers. “Located at the entrance to Stane Retail Park, the store will form part of the gateway into the development which extends over 15 acres and will deliver over 180,000 sqf of new retail space as well as major highway improvements to this rapidly expanding part of Colchester.